Brain Types is the world’s most accurate and sophisticated approach to understanding why people do what they do, on and off the field of play and in and out of the workplace. Scientists are marveling at the new understanding this revolutionary technique brings and its far-reaching implications. A good understanding of this 21st century system will enable you to appreciate and develop others like never before. Each person only has one of 16 Brain Types, and it’s an inborn, genetically predisposed wiring that directly regulates both mental and motor skills. Each Brain Type not only has inherent and specific mental proficiencies (and deficiencies) but physical ones as well. These inborn traits are the greatest determinants for why people do what they do (excluding personal ethics, morality, etc.). By determining an individual Brain Type, one can know even as a youngster what one is best cut out to do in life, and how best to get there. Many frustrations and wasted time can be eliminated, with Brain Typing. Whether it be in business, academics, relationships, parenting, sports, spirituality, vocations or any other aspect of life that deals with people, Brain Types can offer unparalleled insight and strategies for optimizing personal success based on one’s individual and unique design. Though people come in billions of differing nuances, they all have 8 (at least) mental functions upon which they critically rely. The inborn strengths (and weaknesses) of these 8 processes (mental functions), for each person, determine one’s individual Brain Type. Amazingly, each Brain Type has one-of-a-kind body/motor skills, too. Those possessing the same Brain Type will share striking similarities, regardless of people group (often inappropriately referred to as “race”) or environment. Nurturing is very important in shaping each of us, but nature is the single greatest determinant for why we do what we do. In other words, you could have the same Brain Type as Ronald Reagan and John F. Kennedy (FCIL/ENTJ), or one of the distinct Types of the NFL’s Tom Brady or Peyton Manning, the NBA’s LeBron James or Kobe Bryant . . . or perhaps that of Tom Cruise, Johnny Depp, or Oprah Winfrey. You will share many mental and physical characteristics with the celebrities of your personal Brain Type. And, the more you train yourself to be like a well known person or anyone else of your Type, the more you’ll be like them. People of the other 15 Types can never attain the distinct giftedness of your particular inborn Brain Type. We are devoted to helping you know and understand yourself and others more fully.By discovering your God-given design, you will understand why your mind works as it does, why you view matters and make decisions as you do. You will also better understand your emotional makeup. Presented with the physical and athletic perspective, you will know what you are capable of doing and to what degree. Socially, you will better understand why you tend to regard others as you do, and, spiritually, you may see why you view God as you do. The study of human behavior has attracted many theorists over the course of time. The field of psychology is more than simply the study of the psyche or mind; it is preeminently the investigation of human behavior. Those who study the behavior of others have tried for ages to explain both the rational and irrational acts of humankind. Over time, researchers determined that patterns of behavior by people translate into personality types or psychological types. However, almost four decades of empirical research and advances in modern science have revealed that Brain Types is the most accurate way to classify people and understand why they behave as they do. Rather than categorizing people by vague personality nuances, which are impacted by both nature and nurture, Brain Types is solely determined by inborn traits, mentally and physically. These traits are predetermined and fixed, making them easier to identify. The information on this website is solely intended for constructive use, with the goal that we are all able to view others in an educated, rational, appreciative fashion, without making disparaging conclusions. It was one of the greatest experiences of my life to discover how enormously different people’s psyches are. Jung believed that specific patterns, types, or combinations of preferences in humans could be described and categorized. Please note that this refers to Jung’s typology as opposed to his psychology of which we are not advocates. In all, there are four pairs of preferences which he, and later, Isabel Myers, explained and developed. A preference, they concurred, is the conscious or unconscious choice an individual makes in a certain designated realm. These eight preferences are Extraversion (E), Introversion (I), Sensation (S), iNtuition (N), Thinking (T), Feeling (F), Judging (J), and Perceiving (P). Each preference is paired with its opposite. Thus, an individual is considered to be either Extraverted or Introverted, Sensing or iNtuitive, Thinking or Feeling, and Judging or Perceiving. Every individual’s personality is represented by a combination of four preferences, expressed as a series of four letters. An ISFP, for example, is considered to be an individual who is an Introvert, Sensate, Feeler, and is Perceptive. In all, there are 16 different combinations of the preferences making up the different personality types, each with a unique description. This preference analysis does not involve questions of good and bad. There are no superior personality types and no inferior types. Rather, Jung and later Myers pointed out major differences in people’s perspectives, throwing substantial light on why people behave and perform as they do. It is interesting to note that, while much of personality research over the years involved study of the behavior of abnormal people (schizophrenics, mentally ill, etc. ), Carl Jung’s discerning personality evaluations were based upon observing normal behavior in thousands of people over the course of his lifetime. In the same way, the uncovering of Brain Types stems from a detailed, intense evaluation of normal behavior of tens of thousands of individuals. 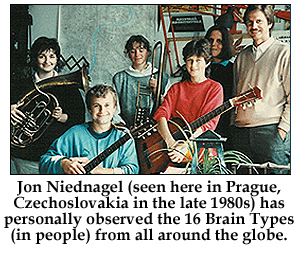 As Brain Type pioneer Jonathan Niednagel became exposed to the world of personality or psychological types in the 1970s, he was greatly frustrated by their strong link to the abstract and ethereal mind. Having a concrete and tangible mindset, he was compelled to take this conceptual typology and give it fleshai??i? ?to establish a biological basis if all possible. Even back then, Niednagel could see that ineffectual testing procedures and the inability to accurately identify the traits in people was skewing the proper and consistent application of typology. To convince himself (and others), he knew it had to be measured tangibly and accurately. Personality to the layperson conveys the sum total of the mental, emotional, and social characteristics of an individual. The term personality, however, originates from the Latin persona. It corresponds to the Greek word for face. Actors in ancient Greece could perform more than one role on stage by donning different personas or masks. But type behavior is not dictated primarily by the faces we randomly choose to wear. Instead Niednagel and others (including neuroscientists and geneticists) believe it is driven by the orderly and systematic function of the brain, which controls not only our mental skills, but motor skills, as well. As he studied this intensely, both through his empirical observation and through modern-day advances in neuroscience and genetics, Niednagel came to the conclusion that there had to be a strong association between the brain and body. In addition, since he was not a psychologist nor did he want to be connected in any way to psychology (even for personal spiritual reasons), Niednagel consciously attempted to distance himself as far as possible. Instead, he set out to figure out for himself, without any pre-existing bias, what was at work here. Now, generally noticing how each person around you speaks, looks, moves, and sees is not a difficult task. Meticulously and painstakingly noticing each person in your presence daily is much more overwhelming. Only a person strong in the back of the brain (true Introversion), one who’s left-brain dominant the conscious and methodical hemisphere, having a mind fixated on what is (Sensing), not what could be, and being more predisposed to logic (Thinking) than feelings could actually endure this grueling venture over a number of decades. Though Niednagel did not consciously realize it at the time (though he is quite sure it is what led him to walk this road), he was innately designed for the job. Consider the story of Gregor Mendel, a 19th century monk and amateur botanist, whose work regarding plants and principles of heredity was almost universally rejected at the time it was revealed. Only after he died did his theories become widely accepted to the point that he is considered today by many to be the father of modern genetics. M.D. and Ph.D. Nancy Andreasen highlighted the story of Mendel in her book, Brave New Brain: Conquering Mental Illness in the Era of the Genome. Human beings have observed for many years that normal and abnormal traits are transmitted within families e.g., eye color, hair color. The process by which much of this transmission occurs was formalized through the painstaking observations of Gregor Mendel. In the mid-1860s, he conducted meticulous experiments on plant life. Mendel’s observations, which we now refer to as classic Mendillian patterns of transmission, created the framework within which genes and genetic transmission are currently understood. Mendel did not know he was studying the effects of genes because the word gene had not yet been coined. He was observing traits or factors. This Austrian monk was able to simply observe what happened to his pea plants based on experimental manipulation, and to deduce the principles of genetics when he did not know that genes existed! All he could see were plants that varied on multiple traits. We can summarize Mendel’s observations and conclusions by using modern terminology. Mendel was observing the phenotype, but behind the phenotype was a genotype Mendel could not see the genotype only the phenotype. Nonetheless, he inferred the presence of something that must represent a genotype, since this was the most plausible explanation of the patterns of transmission that he was observing. Similarly, Niednagel did not come to the conclusions that he has regarding the mind and body easily. It was only after 30-plus years of painstakingly scrutinizing individual and inborn human traits cognitive, motor and spatial that he came to a new and dynamic understanding of what is at work.Ai?? Just as Mendel saw only what is now known to be a phenotype, he inferred the presence of something that must represent a genotype, since this was the most plausible explanation of the patterns of transmission that he was observing. In a similar way, Niednagel deduced (first, in the early 1980s) from what is now called Brain Types the presence of something that must represent a genotype, since this was the most plausible explanation of the patterns he was continually observing.